A catchy and creative presentation example on famous universities around the world and their school mottoes. Download it for free to improve your presentation and impress your audience. 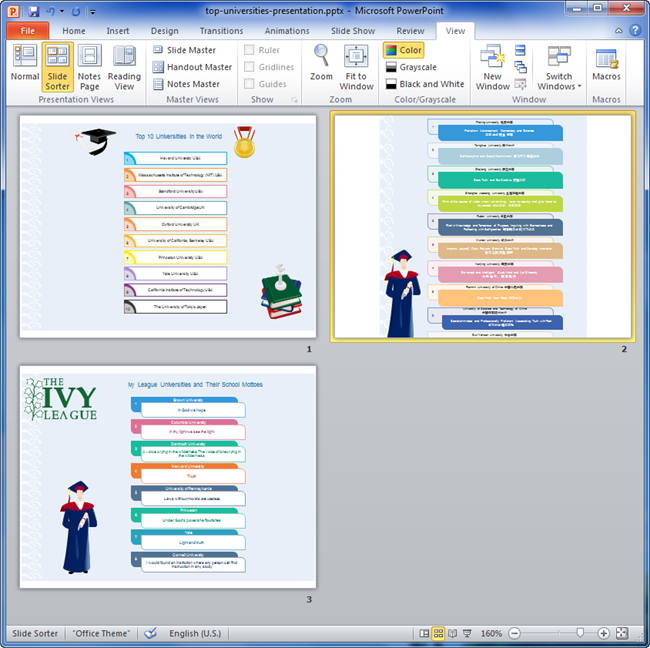 Here is an editable presentation example about top 10 universities in the world and in China and Ivy League Universities. It also lists their school mottos so that readers can know these universities better. Click the following picture or links to download this presentation example. This presentation example is amazing for the highly artistic design with visually pleasing diagrams. Applying list diagram to make such kind of presentation is quite effective. List diagrams are perfect for showing object from top to down in sequence. These slides will surely help you stand out from the crowd. See more list diagram examples. To draw diagrams like those shown in the presentation, try our amazingly powerful diagramming software.